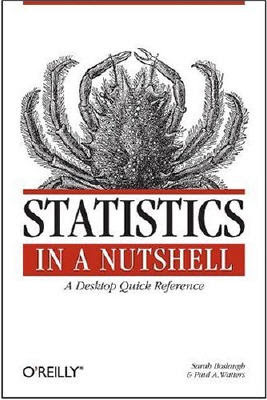 Sarah Boslaugh, Paul Watters, "Statistics in a Nutshell: A Desktop Quick Reference (In a Nutshell) [ILLUSTRATED]"
Need to learn statistics as part of your job, or want some help passing a statistics course? Statistics in a Nutshell is a clear and concise introduction and reference that's perfect for anyone with no previous background in the subject. This book gives you a solid understanding of statistics without being too simple, yet without the numbing complexity of most college texts. You get a firm grasp of the fundamentals and a hands-on understanding of how to apply them before moving on to the more advanced material that follows. Each chapter presents you with easy-to-follow descriptions illustrated by graphics, formulas, and plenty of solved examples. Before you know it, you'll learn to apply statistical reasoning and statistical techniques, from basic concepts of probability and hypothesis testing to multivariate analysis.